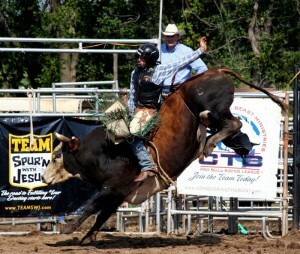 Team SWJ is made up of many young and talented Christian bull riders. Many of which have benefited by our training camps or been greatly influenced by the ministry of Western Harvest and it’s outreaches. Each of them have made a quality decision to not compromise their faith and to allow the Lord to lead their lives. The team concept took birth as a result of watching the young men face challenges that they seamed to encounter for simply standing for what they believe in. Having been in many situations like that in my own career, I felt the need to pray and ask the Lord about what my part should be in helping these young men. The Lord began to show me the importance of each of them being connected and accountable to each other, and to an extreme outreach that they can be proud of and where they can experience a touch from the Lord .We currently have over 50 TeamSWJ members from all over the nation that we are able to consistently work with. We believe with all of our hearts that as we lay a solid foundation for theses young men and their careers, the Lord will have many great opportunities to show himself true to them.